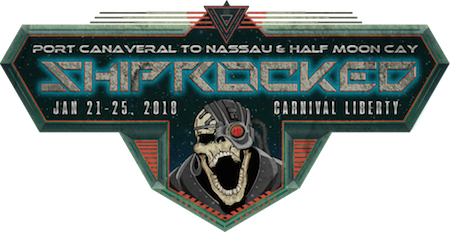 Fewer than 20 staterooms remain for ShipRocked 2018 — "A ShipRocked Odyssey" — January 21-25, 2018 onboard Carnival Liberty from Port Canaveral, Florida to Nassau and the private island of Half Moon Cay in The Bahamas. But the music lineup continues to grow. P.O.D., Otherwise, Like A Storm, Adelitas Way, and The Letter Black join an already stellar roster, including Stone Sour, Seether, In This Moment, Black Label Society, Nothing More, Starset, Beartooth, Red Sun Rising, Shaman's Harvest, Aranda, Badflower, DED, He Is Legend, Royal Republic, Palisades, Doll Skin, Kaleido, and featuring special guests The Stowaways. The ninth edition of the annual vacation experience includes the return of resident all-star band The Stowaways for a pair of special shows with its revolving cast of special guests and surprise performers, bringing a mix of classic hits, unexpected surprises, and a roster of performers that can't be seen anywhere else. 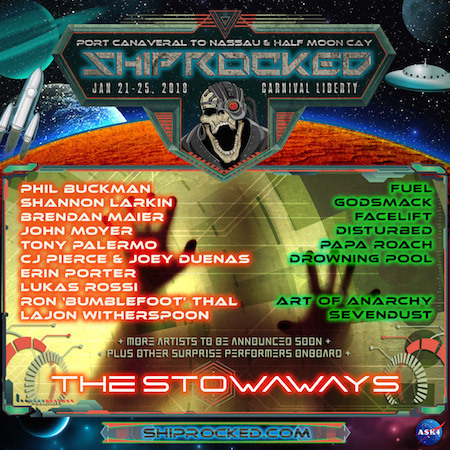 The initial list of band members for The Stowaways on ShipRocked 2018 is as follows: Phil Buckman (Fuel), Joey Duenas (Drowning Pool), Shannon Larkin (Godsmack), Brendan Maier (Facelift), John Moyer (Disturbed), Tony Palermo (Papa Roach), CJ Pierce (Drowning Pool), Erin Porter, Lukas Rossi, Ron "Bumblefoot" Thal	(Art Of Anarchy), and Lajon Witherspoon (Sevendust), with more to be announced. 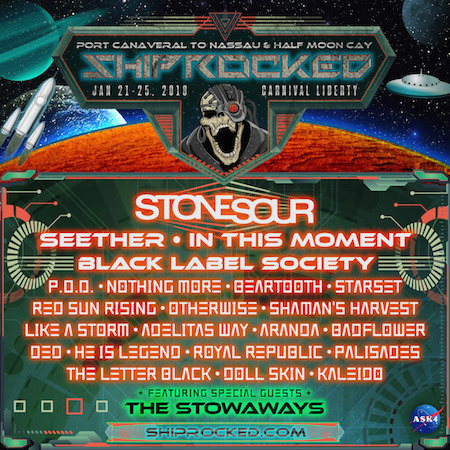 Blasting off from Port Canaveral, FL, ShipRocked 2018 is a once-in-a-lifetime getaway featuring over a dozen bands and gravity defying live performances, out of this world artist hosted events and activities, meet & greets, crazy theme nights, after hours parties and more. Loudwire calls ShipRocked "…a staple of the hard rock and metal event calendar [March 1, 2017]."